Dimensions: W: 13", H: 17.7"
Poul Henningsen designed the three-shade system during 1925/1926. The first lights using the system were designed for an exhibition in Paris. His work with Louis Poulsen continued until his death in 1967. Throughout his life, PH sought to create glare-free lighting; aiming to direct light where it was most needed, and creating soft shadows while using incandescent bulbs as a light source. 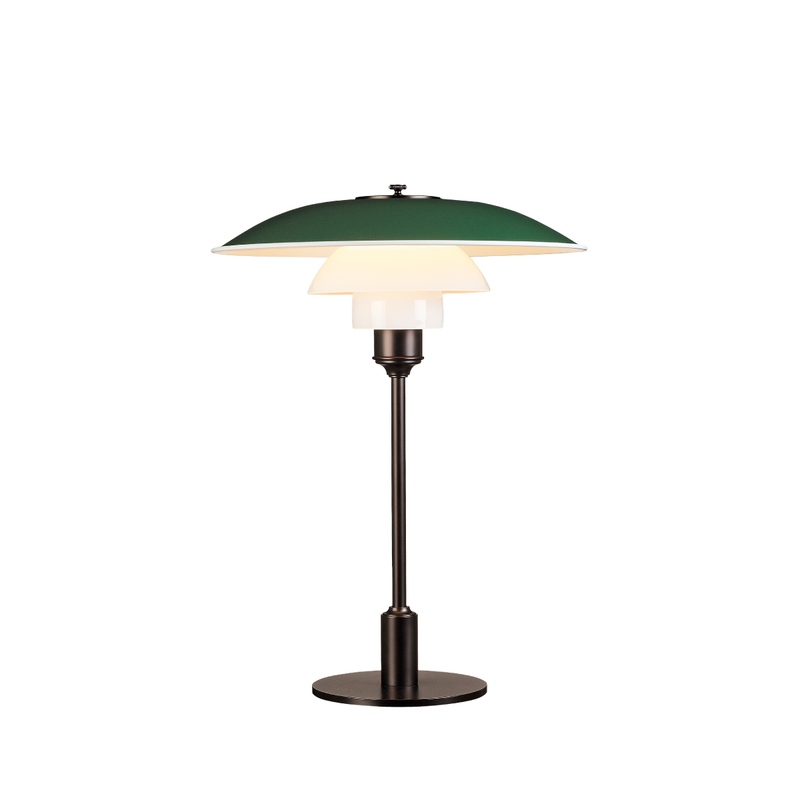 PH 3½-2½ Table is a member of the three-shade family and is one of 19 versions available today. Approximately one thousand different models have been produced over the years and consisted of table, floor and wall lamps, as well as a number of different chandeliers, which were popular in the 30s for lighting private homes with high ceilings. There were countless combination options. The lights were available in different colors, as well as a range of sizes. The first shades were made of metal with a painted undersurface, such as white, gold or silver depending on whether diffuse, warm or cold light was desired. Glass was later introduced for the three-shade system. In addition to the downward-directed light, glass lamps illuminated the room. PH was the first person to pursue a scientific approach to light and use the logarithmic spiral as a basis. By using a design based on the logarithmic spiral he achieved even distribution of light over the entire curve of the shade. This even light distribution, together with the diffuse reflection through the glass, made it possible to control glare and shadow. Each shade reduces the amount of light equally, due to their distance from the light source. The PH light model numbers refer to the shade size. Each top shade had a corresponding set of middle and lower shades. In the pure models, such as the 2/2, the top shade has a size of about 20 cm, with corresponding lower shades. 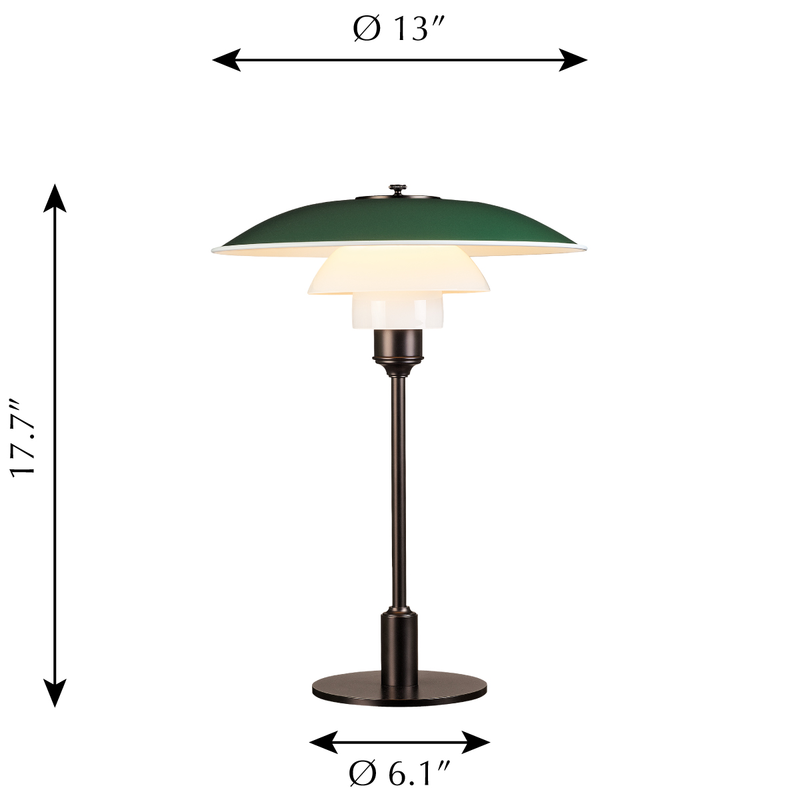 PH 3½-2½ Table consists of an approximately 35 cm top shade, but uses lower shades from the 2/2 model. These hybrid models were introduced due to the desire to hang the pendants at lower heights. The system was also used for wall, table and floor lamps. Poul Henningsen (PH) was born in Copenhagen by the famous Danish actress Agnes Henningsen. He never graduated as an architect, but studied at The Technical School at Frederiksberg in Denmark from 1911-14, and then at Technical College in Copenhagen from 1914-17. He started practicing traditional functionalistic architecture, but over the years his professional interests changed to focus mainly on lighting which is what he is most famous for. He also expanded his field of occupation into areas of writing, becoming a journalist and an author. For a short period at the beginning of WWII, he was the head architect of the Tivoli Gardens project in Copenhagen. But like many other creative people, he was forced to flee Denmark during the German occupation but soon became a vital part of the Danish colony of artists living in Sweden. His lifelong collaboration with Louis Poulsen began in 1925 and lasted until his death in 1967. To this day, Louis Poulsen still benefits from his genius. 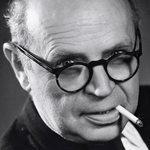 Poul Henningsen was also the first editor of the company magazine "NYT". The CEO of Louis Poulsen at the time, Sophus Kaastrup-Olsen, gave the magazine to PH as a gift after he had been terminated from another Danish newspaper - his opinions were too radical. Poul Henningsen's pioneering work concerning the relationship between light structures, shadows, glare and color reproduction, compared to man's need for light, remains the foundation of the lighting theories still practiced by Louis Poulsen. 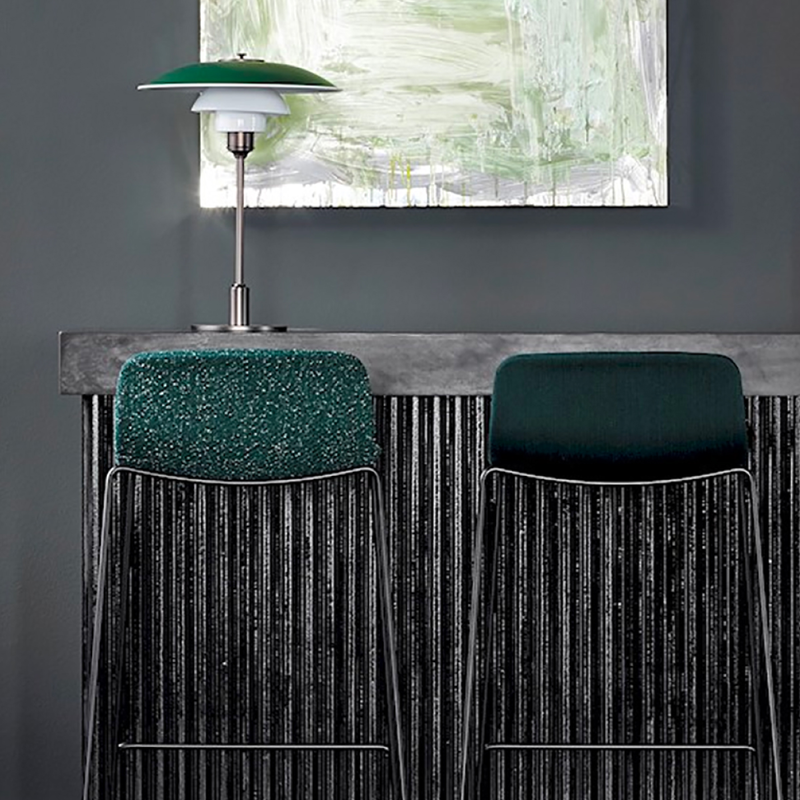 Founded in 1874, Louis Poulsen is the preeminent Danish Design Lighting resource born out of the Scandinavian design tradition where form follows function. The function and design of these lighting concepts are tailored to reflect and support the rhythm of natural light. Every detail in the design has a purpose. Every design starts and ends with light. Louis Poulsen believes in passionate craftsmanship that produces quality lighting and design products that are pleasing to the eye and to the light. In close partnership with designers, architects and other talents like Poul Henningsen, Arne Jacobsen, Verner Panton, Øivind Slaatto, Alfred Homann, Oki Sato and Louise Campbell, Louis Poulsen has established themselves as one of the key global suppliers of high quality architectural and decorative lighting. Defying traditional product categories, their products serve and span the professional and private lighting markets for both indoor and outdoor applications. 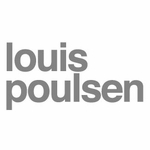 Louis Poulsen�s means are simple and beautiful design. The purpose is to create an attractive ambience that affects people and spaces. 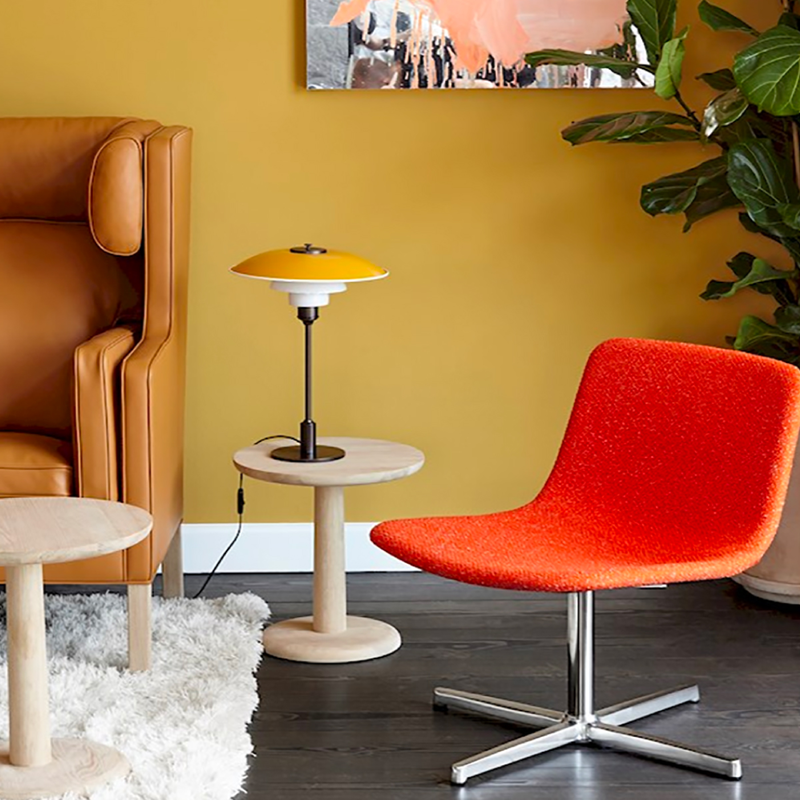 The Louis Poulsen Collection is designed to shape light and are a key decor and furnishings element to create a Scandinavian sensibility for the home and garden. These simple lines, sophisticated styling, and impeccable craftsmanship are the hallmarks of Louis Poulsen and are key values of Fjorn Scandinavian.